was that I finished my book! I know it doesn't sound that exciting but I hadn't read a book for fun in a LONG time! My book of choice was "Me Before You". Even though I had heard of this book before and it came highly recommended by a fellow blogger, I had no idea what it was about. I never read the book summary because I can usually figure out what's going to happen. I knew it was going to be a movie later this summer so I figured it would be a good story. I must say that even though this book is going to be a movie, I had not seen any of the previews. I expected maybe a sappy romance novel but I did not expect the story to be about what it was. I will not give it away in case you want to read it but I will say that this book was emotionally hard on me. The fun part about reading a book that is also a movie is going to see the movie afterward (kind of like a reward to finishing the book). I did that with the Hunger games, Something borrowed, Marley and Me (which I admit was a bad decision to see the movie after already knowing how the book ended. Why did I put myself through that ? ), and many more. But now I don't know if I want to relive the emotional roller coaster that was Me Before You by seeing it all play out live on the big screen. I'm sure those of you who have read the book know what I mean. But on the other hand I feel like I am emotionally invested in these characters and that I should go to the movie. I guess I have until June 3rd to decide. Just a side note: This book is not about running but the main character has a boyfriend who is into marathons and triathalons, and I find it funny her perspective of his training as a non-runner. At one point she jokes about how she finds it funny that when she goes out to dinner with him and his friends she is the only one that orders french fries and she doesn't even feel bad about it as she eats them in front of every one! The other highlight of my week was doing the Girls On The Run 5K. Because of all the foot pain I've been having, I was sure I would be in pain by mile 2 (that's usually when the pain starts when I am on my walks), but it didn't! I got through the entire race pain free. 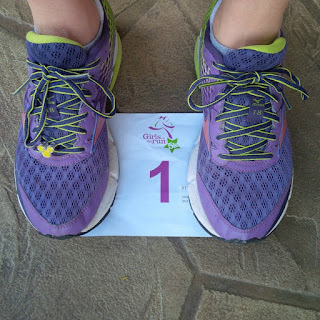 The only painful part was walking around the race afterwards because I still have the blister on my heel that I got from walking the trail last Sunday while I was searching for my phone. I have to say this is the first time I showed such restraint and hadn't popped the blister. The only reason I hadn't popped it was because I knew I had the race this weekend and figured it would hurt more if I did. We have to remember that our body uses blisters to protect us from worse pain! 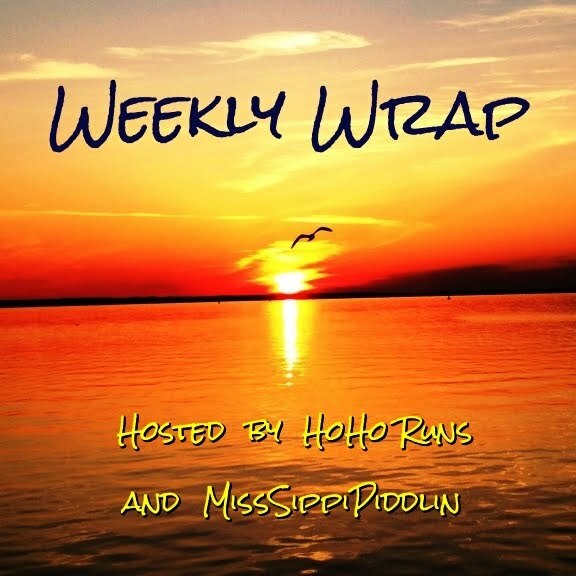 Thank you to HoHo Runs and MissSippiPiddlin for hosting the weekly wrap! I loved Me Before You and I don't know that I want to see the movie either. Besides the whole emotional thing, the book was so good that I don't see how the movie can be better. Yay for no foot pain at your race! Those damn feet! My PF is angry at me today for running 8 miles this morning. In a way, I kind of want to see the movie just to see how it compares to the book. I think I'll stay away from that book. I don't like emotionally difficult books or movies. Yay for running the 5k pain free! Oh and I'm sure you'll see the previews for the movie on TV soon enough. I saw it several times just this weekend. Really happy for you with that pain-free 5K! 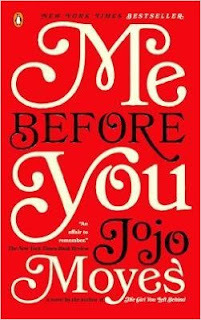 If I love a book, I usually don't like the movie version...I haven't read Me Before You but now I'm thinking I should. To tell you the truth I probably wouldn't have picked this book had I known what it was about but once I started it I was definitely intrigued. Yay for a pain-free race! I just hope I can start doing more than 3 miles now. I don't think a few more rest days will hurt though! People keep recommending "Me Before You" to me and I keep turning it down. At first I thought it was a romance and I wasn't interested. Now I know what it's about but...I don't usually like modern literature/NYT bestseller kind of stuff. But the movie is piqued my interest so maybe I'll try the book after all. I blame the cover for my reluctance; whoever designed it really went with the romance-vibe. I don't think I would have picked this book had I known what it was about. I definitely think knowing it was a movie persuaded me to read it! 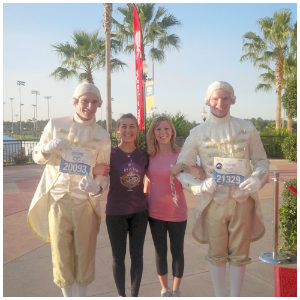 Yay I am glad you had a pain free 5k!!! Oh I love a good thunderstorm (as long as my cars are home in the garage). I already had to pay to repair one car that was damaged by hail and I was Not happy about it! I have heard good things about that book and will hopefully read it before the movie comes out. Glad you made it through the race pain free! Thank you Lisa! Enjoy the book. I've seen the preview for the movie but actually didn't know it was a book...might have to check it out. Glad the race was pain free for you! Luckily I didn't see any of the previews until After I finished the book! Well yay for getting through the race pain free! I always enjoy seeing a movie after I read the book, I like to see if I feel they captured it. I loved The Host, I thought they did a good job with the movie. Yea, I don't think there was a dry eye in the theatre when we saw Marley and me. It's even worse now cus I have lived through that with one of my labs. I've seen commercials for the movie and I'm already annoyed - wasn't she supposed to be on the frumpy side (or at least thought she was?) -- she's very cute in the movie. Glad your foot held out for the 5K. Hmmm, frumpy i'm not sure of. I know she wasn't very "worldly" and lived a pretty sheltered life. However, the author made it sound like she was a fashionista! Great job on your race! I hope your foot continues to improve. I'm always wary about books made into movies, especially if I love the book. Hollywood doesn't have a good track record with book adaptations, and I've been disappointed too many times. Thanks Lesley! I'm hoping with a few more days rest it will be back to normal. I loved that book! I'm not sure about the movie...I always enjoy the "pictures" in my head when I'm reading. Yay for no foot pain during the race! I hope that it doesn't come back! You have me intrigued now, I am going to have to check out this book. Have you read the Divergent series? It was really good so were the movies! Great job on your 5K! That's always great when the pain goes away for a race! Hope it stays away! This is actually the first one I never popped! Yay for no pain during your run!!! And I LOVED that book! Very emotional but an amazing story! I can't wait to see the movie! Will you be going opening night? I'm very glad you had no pain during your race! those are wonderful news! 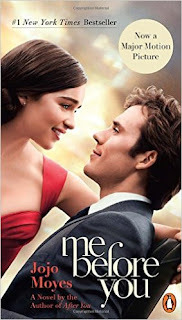 Me Before You is such a great book! I'm going to see the movie, but will not read the next book. I will pack my tissues, a bucket of popcorn and cry my eyes out. Just curious, why don't you want to read the next book? Because I've read reviews of it, and it sounds pretty awful. And because of how this one ended. If the end would have been different, I would read it. I haven't read the reviews but if the first one had ended differently I could at least see where the second book was going with the story line. Since the story ended as it did, I really don't know where the author is now going with this story. I may read it just out of curiosity! Let me know if you read it. I read that there is just no story there... but I'm also curious to see what would happen next. Great that you got through your 5k with no pain. Thanks for the book warning. I am not much for drama but you know, once you start a book, it's like you have to finish it. I don't like when I start one and make myself finish. Suspense with a side love story (that ends happy) is what I usually look for. Have a great week!! I love your shoe charm! I'm glad you didn't have any pain at your run, that's great! Yay for GOTR! My niece is doing hers next weekend. Here the kids can't participate until 5th grade and that kind of ticks me off. Glad your foot is behaving. I'll have to check out that book!! Glad your foot is feeling better. Have a great week! I love thunder storms, but we rarely get them here in France. Glad your foot is better, even if temporarily. I never get blisters anymore because I put cream on my feet every evening... it was the podiatrist who suggested it. It keeps them supple. If that is a word. I'm usually disappointed in a movie if I've already read the book. A movie just doesn't provide the depth and detail that a book can. I like to read when we travel, so I'll keep this book in mind. It's wonderful to hear your foot gave you no trouble during the race. I hope this means you are on the mend. Thanks for linking with us Meranda. Yay for no foot pain! GOTR is such a great organization - it's terrific that you're working with them! I haven't heard of the movie or the book- maybe we should trade and I will send you mine and you can send yours! 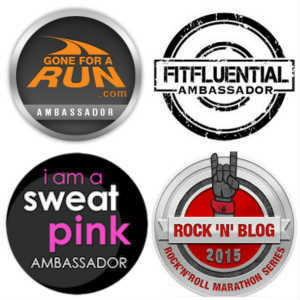 :) Congrats on the pain free 5K- awesome! When I've read books and they make a movie about it later, that is exactly my thoughts too. The movie is the reward for reading the book. You would never guess by the amount of blogs I read, (I think that is different) but I don't really like to read much so I need some kind of reward! 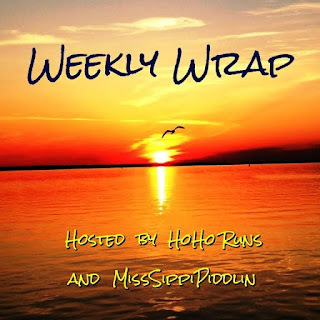 Thanks Meranda for linking up with us! I saw the preview to Me Before You the other night. I didn't realize it was a book. It looked like a good story line. Nice job on your Girls on the Run 5K. I hate blisters. Sometimes you just have to pop them.